HOW do you feel when the word shark is mentioned? Do you feel fear, excitement, sadness, blessed? For my four-year old nephew Kieran, a shark is a friendly animal named Lenny from the animation movie Shark Tail. When I left Fiji on this voyage, Kieran asked that if I saw Lenny if I could say hi for him. I feel Kieran is lucky in that he has only good feelings toward sharks unlike myself who grew up watching the movie Jaws, fear of them and thinking that they are only man eaters were instilled in me at a young age. I ask myself, "why do I fear sharks when I haven't even encountered one while swimming in the ocean?" I can only put my fear down to how sharks are perceived in movies and the media. I recently watched a documentary called Sharkwater produced in 2007 which has changed my way of thinking toward these amazing sea creatures. 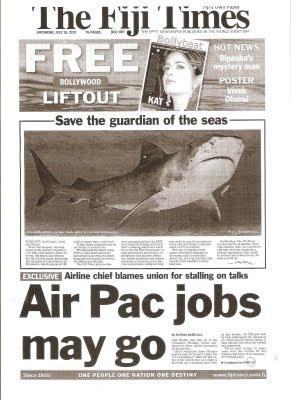 I learnt and have extracted some info from the documentary which I feel is important to changing people's fear toward sharks as it has for me. Sharks have been around before the dinosaurs and are the only large animal that's remained unchanged for 400 million years. New animals to evolve in the ocean have been shaped by their predators, the sharks, giving rise to schooling behaviour, camouflage, speed, size and communication. Sharks control the population below them, eliminating species that are easy prey and creating new ones. Even though sharks have very few young and take up to 25 years to reach sexual maturity they have managed to survive through five major extinctions that wiped most life from the planet. They are architects of our world. They are the perfect predators that hold the underworld in balance. The fact is sharks do not eat people. Most sharks lack the equipment they need to go after large animals like us and they know that. They have evolved to eat certain prey animals and most sharks are picky eaters. When a shark mistake does happen, the person inevitably ends up back on shore. In most shark attacks flesh is never removed. Even in the odd case where someone dies it's usually because of blood loss not because the shark ate the person. 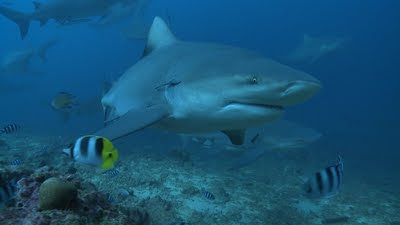 With so many shark diving tours in Fiji taking out hundreds of divers each year, I have not heard of one shark attack. Shouldn't this say tell us they are not the man eaters most of us are led to believe. If you look at statistics more people die from car accidents, drug-related problems, drowning etc than shark attacks. I've been told that divers understand them better because they come face to face with these magnificent creatures and most of the time the sharks are more scared of the diver than the diver is of the shark. Sharks are just like dogs. You tease them or intimidate them you get bitten, no difference. A dog chases a car, a bicycle or a jogger but a shark will rarely chase a surfboard or a trawling line or a diver. Skipper says that sharks don't like biting Fijians because the shark's mouth gets all numb from all the kava that Fijians drink. Peter Benchly who directed and Stan Waterman who was involved in the under water filming of Jaws (who skipper knows personally) said they deeply regretted making the movie because of the negative impact it had on sharks after the movie was released. Stan Waterman, who is in his 80s and is still an avid diver, has been and still is very vocal and passionate about the conservation and protection of sharks. We need to be start protecting these helpless creatures. 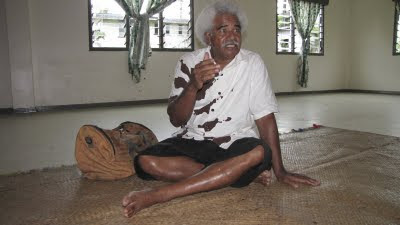 We need to implement laws in Fiji to stop the slaughtering of sharks for their fins. Think twice people when you order a shark fin soup. The ocean is basically the life support system of the planet. To change that life support system in any major way is a risky thing. A few of the crew members on the Uto Ni Yalo who have their diving certificate have convinced me to get mine as well which I will surely be doing when I get home. I know my heart will most probably start racing when I finally come face to face with a shark but I am looking forward to facing my fear and experience swimming among these amazing magnificent creatures in the near future. * The world's shark population is estimated to have declined by 90 per cent. * Sharks kill 5 people each year. In just one year crocodiles around the world wiped out as many people as sharks have killed over the past 100. Crocodiles are protected. 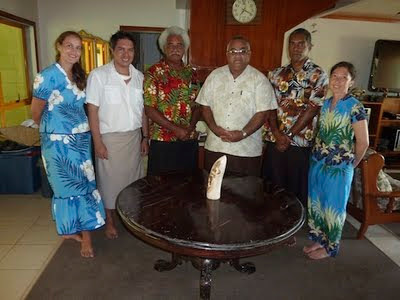 Lee-Anne Lee is aboard the Uto Ni Yalo sailing from Fiji to San Francisco. Guam is the third place in the world to ban the sale, trade, and possession of shark fin. Advocates for the ban included hundreds and thousands of school children from Simon Sanchez High School and George Washington High School. The students attended a public hearing for the shark fin ban held on February 1, 2011. The students came prepared with written and spoken testimony, posters, and even a shark costume. The students were ultimately able to build so much support that the bill unanimously passed the Guam Senate and went on to be signed by Governor Eddie Calvo on March 9, 2011. A familiar metaphor for nature is the pyramid of life, with large predators living at the peak because they’re few in number and eat species lower on the pyramid. Like most simple metaphors, this one has a perceptual flaw. It creates the illusion that large predators have an effect only on the prey species immediately below them. The truth, as a growing body of scientific studies shows, is that the presence, and absence, of top predators cascades all through nature in surprisingly complex ways. The loss of cougars in what is now Zion National Park led to an “eruption” of mule deer, which reduced riverbank vegetation and, ultimately, changed the shape of stream channels. The loss of sea otters along the Pacific Coast led to the destruction of kelp forests and the many creatures they supported. The effect includes herbivores. When disease decimated wildebeest in East Africa in the late 19th century, grassland turned to shrubs and into fuel for wildfires, changing the ecosystem. In the rare cases where top predators have been reintroduced, the benefit is profound. The success of gray wolves in Yellowstone changed many things. Grizzlies fed on their kills. Coyote numbers dropped and the numbers of small mammals climbed. Elk spent less time in creek bottoms, where they were more vulnerable, and streamside ecology changed as a result. It is now clear that biological diversity increases when top predators are present. The pyramid is healthiest when its peak is still present and when humans aren’t the only top predators around. Fear them or feel sorry for them. Time isn't on the side of the shark. Emotional attachments may not protect them unless action is taken to create awareness about the plight of millions of sharks around the world annually. Considering the shark has existed for 415 million years, having survived the changes of time which the dinosaurs, appearing 185 million years later, could not, their plight is deserving of attention. Today they are on the brink of extinction. The international demand for shark's fin, shark meat, and liver oil has reduced the shark population around the world. Yesterday The Fiji Times started a campaign to create awareness of the great danger this predator of the sea now faces. In partnership with experts and advocates, we will bring you a series of articles and exclusive pictures to help in the protection of the often misunderstood shark, whose existence ensures there is a balance in our marine ecosystems and helps safeguard our reefs for our future generations. The Fiji Times joins a massive campaign led by the Pew Environment Group and The Coral Reef Alliance (CORAL), which are working with the Fiji Government, to pass permanent protection laws to safeguard this ancient predator. A drastic reduction in the number of sharks could cause unpredictable and irreversible damage to the ocean and to economic activities, such as tourism, that benefit from healthy marine habitats. Sadly though, a study of the Hong Kong shark's fin market estimated that up to 73 million sharks are killed each year simply to supply the fin trade. Scientists believe there are more than 100 million sharks killed annually for fins, meat and other products. The fact that experts have indicated changes in the number of sharks visible on guided dives in a number of tourist spots in the country is worrying. It does raise the issue of our involvement in the shark fin trade. 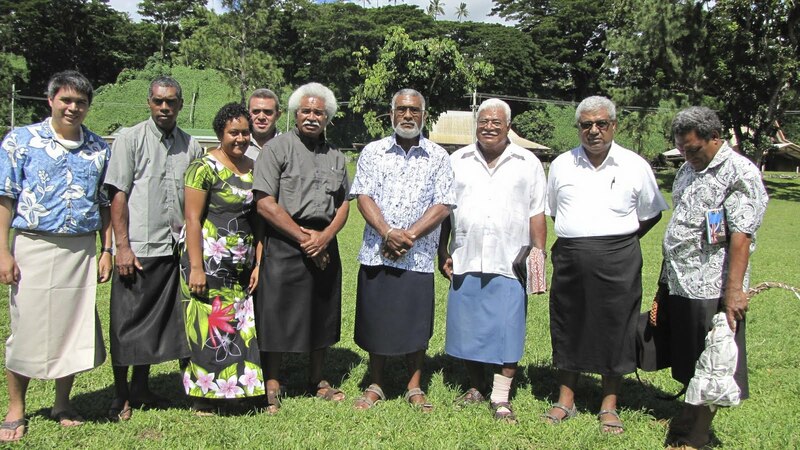 If that is happening in the country, it raises the issue of whether there is an opportunity for a concerted effort to find out how big the business is in Fiji. Interestingly, the question of whether placing a ban on shark's fin soup could reduce the number of sharks killed merely for their fins annually is one that will be met with scepticism. An effective awareness campaign targeted at the people involved in this lucrative trade could have a positive impact. Movies like Jaws unveiled a monster of the sea. It firmly placed the fear factor on sharks. This campaign is about putting the shark in its right place. Lest we forget, the shark has an important place in the mechanics of marine life as we know it. ELEGANT, intelligent, loved and feared. From the deepest, darkest abyss in the world's oceans to the light-blue waters closer to home, the shark has existed for 415 million years, surviving the changes of time which the dinosaurs, appearing 185 million years later, could not. Today, these creatures are on the brink of extinction. The demand for shark's fin, shark meat, liver oil and other products has drastically reduced shark population around the world, including our islands. The Fiji Times joins a massive campaign led by the Pew Environment Group and The Coral Reef Alliance (CORAL), which are working with the Fiji Government, to pass permanent protection law to safeguard this ancient predator, whose existence has helped maintain a balance in our marine ecosystems, safeguarding our reefs for our future generations and providing a valuable asset to Fiji's economy. The loss of sharks could cause unpredictable and irreversible damage to the ocean and to economic activities, such as tourism, that benefits from healthy marine habitats. 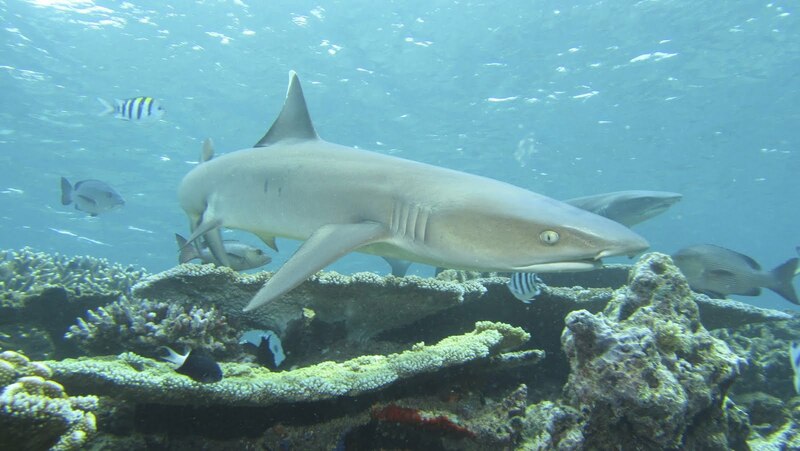 On Monday, The Fiji Times starts a series on sharks, their relationship with our islands, and why we must maintain a mutual agreement our ancestors made to protect our resources in the seas around us. Oceanic whitetips (Carcharhinus longimanus) were accorded protections by the Inter-American Tropical Tuna Commission (IATTC) at their recently completed meeting in La Jolla, California. They are the first shark species to receive regional protections in the eastern Pacific Ocean. 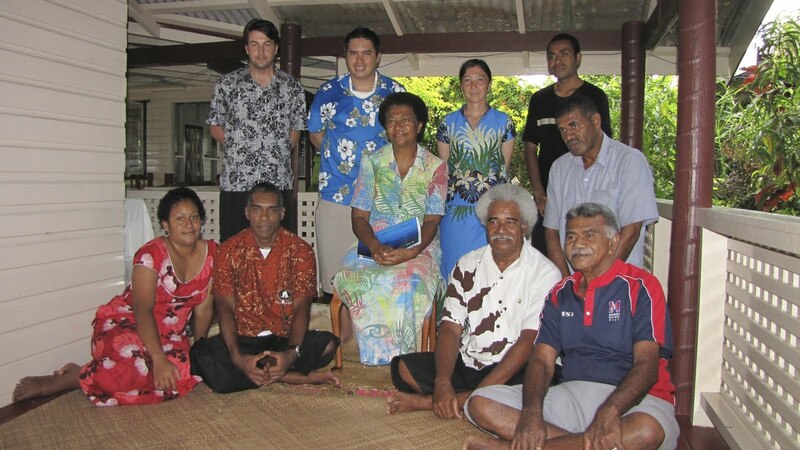 IATTC is a regional fisheries managment organization comprised of members representing fishing nations. They are responsible for managing tuna fisheries in the eastern Pacific Ocean across an area of about 26 million square miles. IATTC member nations agreed that all oceanic whitetips must be released when they are captured in tuna-fishing nets and on longlines, a type of fishing gear that sets hooks underwater on a single "long-line" up to 30 miles long. 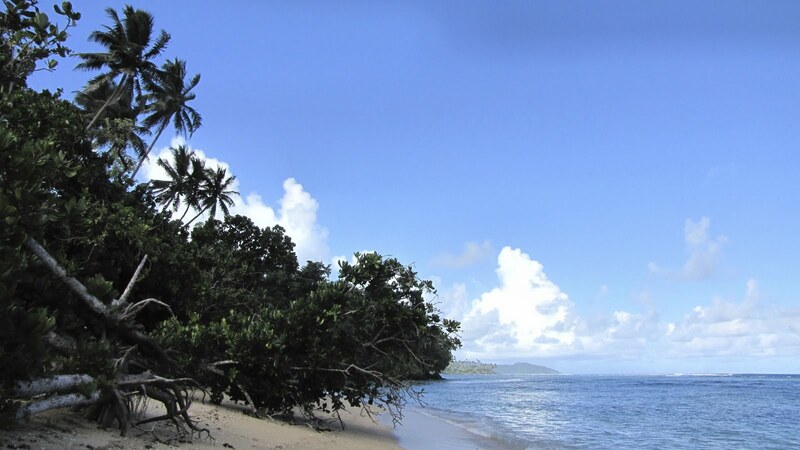 These protections are a step in the right direction and mimic similar protections given to oceanic whitetips in the Atlantic by the International Commission for the Conservation of Atlantic Tunas in November 2010. 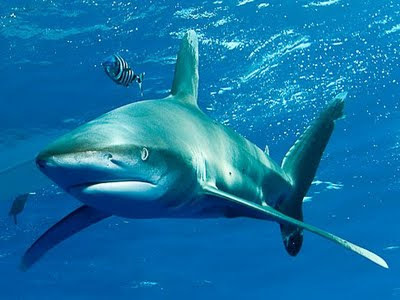 The IUCN Red List of Threatened Species assesses the oceanic whitetip as Vulnerable to extinction. Furthermore, they are assessed as Critically Endangered in the Northwest and Western Central Atlantic. 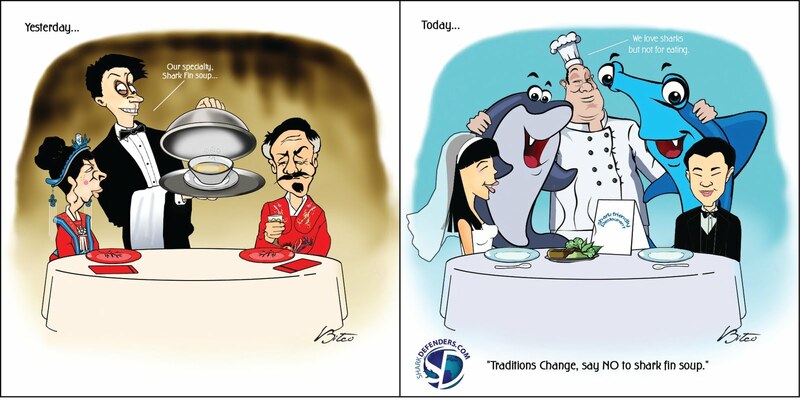 The declines are attributed to the ever rising demand for shark fin soup. Shark Defenders congratulates Japan and the European Union for sponsoring the protections. Sharks passing through some parts of the Pacific and Caribbean can swim a little easier thanks to new laws recently that create permanent shark sanctuaries. Jorge Ribas reports. Shark Defenders commends Pew Environment Group, Bahamas National Trust, and the people and government of The Bahamas for passing permanent protections for sharks. Great shark conservation news today! The Bahamas just announced they are amending existing fishing regulations to prohibit the commercial fishing of sharks in their country’s full Exclusive Economic Zone. The new sanctuary for sharks is the result of a year-long partnership between the Pew Environment Group and the Bahamas National Trust (BNT). They collaborated to work with government officials, build public support for shark protections, produce public service announcements for television, and collect signatures for a petition, which was signed by more than 5,000 Bahamians. If sharks could talk, they would thank Pew and BNT for their dedication and hard work to protect these important apex predators. Shark Defenders commends Pew, BNT, and the people and government of The Bahamas for taking this important step towards protecting global shark populations. Combined with the forward-thinking, decades-old ban on long line fishing, Bahamian waters are now one of the safest places for a shark to swim. 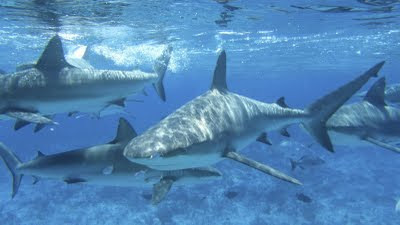 Please leave a comment on the Protect the Sharks of The Bahamas Facebook Page to thank BNT and Pew on behalf of sharks. In a news release, Jill Hepp, manager of global shark conservation for the Pew Environment Group, said, “2011 is fast becoming the year of the shark,” She is right. 2011 has seen shark fin bans signed into law in Northern Mariana Islands, Guam, and Washington, as well as the closure of shark fishing in Honduras. A bill banning shark fin sits on the Oregon governor’s desk and a similar bill is winding its way through the California State Senate. These conservation measures are so important for the future of sharks. For 400 million years, every creature that swam in the ocean had to contend with sharks. This predator-prey relationship has driven evolution, leading to schooling behavior and other unique adaptations, and has resulted in the oceans that we know today. As apex predators, sharks bring balance to the oceans. Sharks are also important to the economies of many coastal nations. 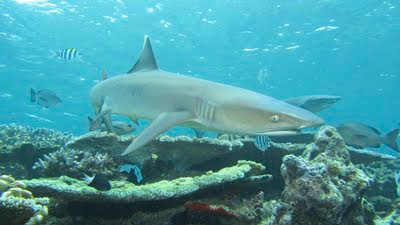 In the Pacific nation of Palau, shark diving brings in approximately US$18 million annually. Shark-related tourism has contributed more than US$800 million to the Bahamian economy since longlining was banned. Sharks are slow growing, take up to twenty years to reach sexual maturity, and produce few young. As a result, their populations are unable to keep up with the industrial power of modern fishing fleets. 73 million sharks are killed each year for their fins alone, and as a result nearly one third of all shark species are Threatened or Near Threatened with extinction. Enacting shark fin bans and creating shark sanctuaries will ensure that our oceans have healthy shark populations in the future. Looking to where the next shark conservation measures may be enacted, last month leaders from across the Western Pacific attending the 30th Association of Pacific Island Legislatures meeting in Palau called for a region-wide ban on the sale, import, export, and possession of sharks and rays. There have also been media reports that the government of Fiji is considering shark protections. You can follow these developments on Facebook at Micronesia Shark Defenders and Fiji Shark Defenders, respectively. But the spotlight for now needs to be on The Bahamas for their bold move. Congrats and thank you to the Right Honorable Hubert Ingraham, the Prime Minister of the Bahamas, and Lawrence S. Cartwright, Minister of Agriculture and Marine Resources, as well as the Pew Environment Group and the Bahamas National Trust.